The EU has moved to ease air travel curbs imposed after much of Europe's airspace was shut because of the spread of volcanic ash from Iceland. Transport ministers proposed creating a core no-fly area, a limited-service zone and an open-skies area. But the UK later scaled back plans to reopen its airspace as the eruption strengthened, spewing a new ash cloud. The International Air Transport Association earlier labelled the chaos a mess and an embarrassment for Europe. The body says its losses have soared over $1bn (£650m; 740m euros), since much of Europe's airspace was closed last week because of ash from southern Iceland's Eyjafjallajoekull volcano. Following talks with the EU's 27 transport ministers by video conference, Transport Commissioner Siim Kallas told reporters in Brussels more planes should start flying from Tuesday. 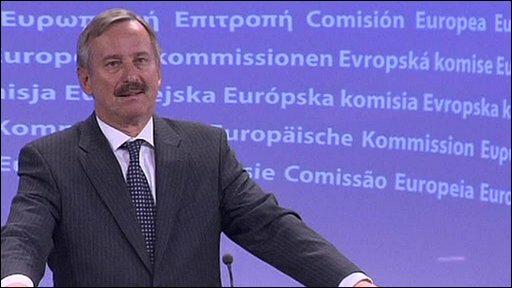 EU Transport Commissioner Siim Kallas: "We should see... more planes start to fly"
He added: "There cannot be any compromise on safety. All the decisions must be based on scientific evidence and expert analysis." British Airways was the latest airline to call the flight bans unnecessary. However, the UK's air traffic control body, Nats, later warned that the volcanic eruption had renewed, and revised its plans to reopen airports across parts of the UK. Airspace in Scotland and parts of the north of England was still expected to reopen on Tuesday. But plans for flights to resume at airports in Northern Ireland and as far south as London look doubtful. "Since our last statement at 1530 [Monday], the volcano eruption in Iceland has strengthened and a new ash cloud is spreading south and east towards the UK," said a statement from Nats. "This demonstrates the dynamic and rapidly changing conditions in which we are working." British Airways says it is "reviewing" its plan to resume flights from London airports from 1800 GMT on Tuesday, in the light of the latest reports. Experts had earlier said the volcano - which erupted last Wednesday for the second time in a month - was now spewing more steam and less ash. A US official said on Monday a Nato F-16 fighter jet had suffered engine damage after flying through the volcanic ash cloud. In the high temperatures of an engine turbine, ash can turn to molten glass and cripple the engine. Meanwhile, the UK deployed three Royal Navy warships to help pick up stranded passengers from Spain and the Channel ports. In Spain, where all airports were open, the government offered to let Britain and other European countries use its airports as stopovers to get passengers moving again. The two main German airlines, Lufthansa and Air Berlin, were granted exemptions from the flight ban to fly home thousands of stranded passengers. France said it was reopening air corridors for flights between Paris and southern French cities, and eventually all its other airports. Some passenger flights will be allowed to leave Schiphol Airport in Amsterdam from Monday night, said the Dutch transport minister. Airspace in Belgium, Italy and Denmark is also due to begin opening from Tuesday morning. But Finland shut its airports again until Tuesday afternoon. Airports have already reopened in Austria, Estonia, Hungary and Turkey. European airlines have asked the EU and national governments for financial compensation for the closure of airspace. EU Trade Commissioner Karel De Gucht said the bloc's economy would suffer badly if the disruption continued for a long time. "What makes me a little bit afraid is that there is no timer on this volcano," he told news agency Reuters. The shroud of fine mineral dust particles from the volcano has spread from the Arctic Circle in the north to the French Mediterranean coast in the south, and from Spain into Russia. 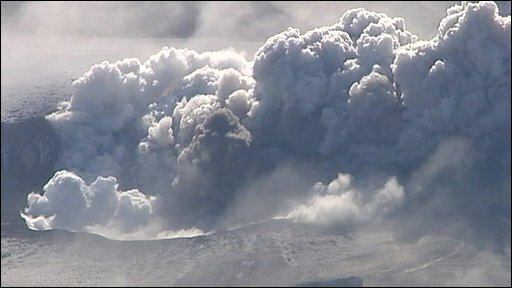 Have you been affected by the volcanic eruption in Iceland or by disruptions to air traffic caused by volcanic ash? Send us details of your experiences using the form below. Send your pictures or videos to yourpics@bbc.co.uk or text them to 61124 if you are in the UK or+44 7725 100 100 if you are abroad. If you have a large file you can upload it here.